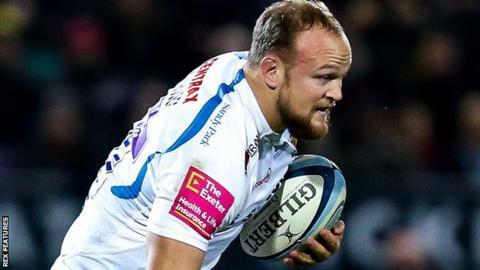 Exeter boss Rob Baxter says the club could not keep Tom Lawday and abide by the salary cap, after Harlequins announced they had signed the forward. The 25-year-old back row has impressed in his first season with the first team after coming through Chiefs' academy after attending university in the city. He is the second player Exeter have reluctantly let go to keep under the £7m cap following Santiago Cordero. "You just can't keep everybody, it's just not possible," Baxter said. "The days of every player who wanted to stay stays at Exeter - they're gone when you talk about salary caps and successful teams," the Exeter boss added to BBC Sport. Exeter will bring in British and Irish Lions full-back Stuart Hogg after the World Cup and already have experienced internationals such as Alex Cuthbert, Dave Dennis and a number of players in the England squad. "It's a tough scenario but one you've got to get the balance of," Baxter added. "Would I have liked Tom to stay? Of course I would, he's come through and played some important games for us. "Is it possible for him to stay and Dave Dennis to stay and Stuart Hogg to come in and to have Henry Slade, Jack Nowell, Luke Cowan-Dickie, Sam Skinner, Jonny Hill, Matt Kvesic, Nic White, and Ollie Devoto to be here? At some stage you've got to make decisions and that's where we are."